Twenty-six years after the Iota Xi Chapter was chartered at Norfolk State University, Alumni Brothers of the Iota Xi Chapter were granted a Local Alumni Association this past spring. In the months since, Brothers have been very active with worthwhile projects on behalf of the band program at Norfolk State. For starters, our Association held a Water Drive, gathering cases of bottled water for the NSU Spartan “Legion” Band for band camp and the marching season. We collected nearly 250 cases of Aquafina water (due to contractual stipulations between the University and PepsiCo). At the end of band camp, we awarded our first annual scholarship to the Most Outstanding Rookie as voted by the Drum Majors and Section Leaders. The award recipient lost his father prior to band camp but continued showing great dedication and commitment. In late August of this year, we teamed up with the Raleigh-Durham Chapter of the NSU Alumni Association to feed the Spartan Legion Band before they returned home following their performance at the Queen City Battle of The Bands in Charlotte, North Carolina. Coordinating with the Raleigh-Durham alums provided a great networking opportunity and a chance to fellowship and serve alongside others who share the same love, pride, and dedication to Norfolk State University. 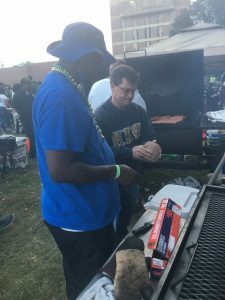 One point of pride for our alumni is the annual Homecoming tailgate where we feed the current and alumni bands during and after day-long homecoming activities. Brothers, along with our sisters from Epsilon Sigma, arrive before sunrise to set up, cook, and serve well into the night. Each year gets bigger and better! Sadly, in the midst of our Homecoming service, we were informed of the passing of our former Director of Bands and Chapter Advisor, Mr. Alzie Francis Walker II. In his honor, Brothers of the Chapter helped plan and execute the memorial services in Mr. Walker’s hometown of Norfolk, Virginia. With more work to do and goals to accomplish, the Brothers of the Iota Xi Alumni Association stand committed to further the Purposes of the Fraternity as it pertains to the band programs at NSU. Behold! We are still striving! Read the full Spring 2018 Edition of The Podium on ISSUU here!